Last month, we submitted an historic landmark nomination form for the former Carrick Municipal Hall (1806 Brownsville Rd.). The borough of Carrick became an independent political entity in 1904 and construction of the Municipal Hall would begin in 1905 after noted Pittsburgh architect, Edward Stotz was commissioned for the building’s design. In Carrick’s Borough Ordinance No. 11 Section 1, passed on December 27, 1904, Stotz was officially selected to use his design for the two-story building “to be used a house for Fire Company, Town Hall, and for other Borough purposes”10 (Figures 7, 8). The contract for the construction of the building was awarded to the George M. Hall Company which, like Stotz’s architectural firm, still exists today. Many factors went into the planning of the borough building, but the engine company was by far the most influential in the design process. The building’s setback from the street was to allow for a greater turn radius for the fire engines, the first floor was comprised entirely of accordion garage doors, and the building featured a forty-foot bell and hose tower. In 1927 after debate and deliberation through much of 1926 among the people and council members, Carrick was annexed into Pittsburgh becoming the 29th ward. The final meeting of the Town Council of the Borough of Carrick was held on January 2, 1927. 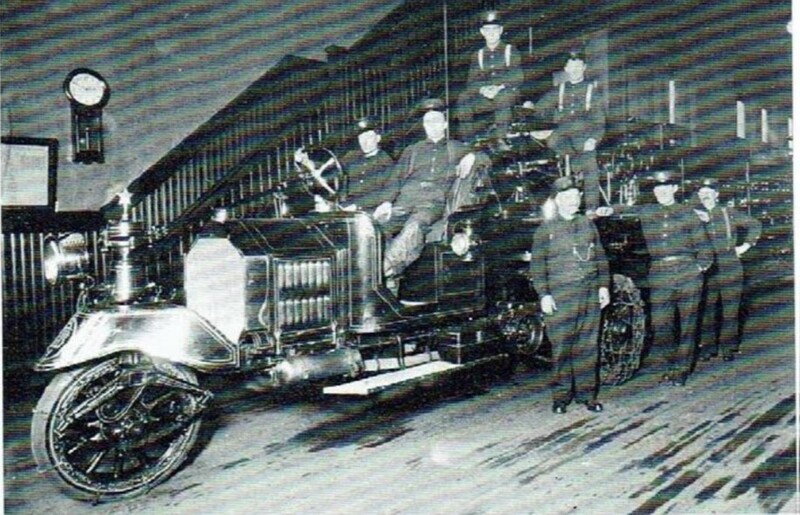 After Carrick was annexed into the city the police and city offices were moved to different locations, leaving Engine Company Number 23 as the sole occupant of the building until they too departed for newer facilities in 1957. Today the building is privately owned and houses two prominent business of Brownsville Road, Farnsworth Gowns and Blanc de Blanc Bridal. In November, the Historic Review Commission found the building eligible for historic landmark status because of its affiliation with Edward Stotz, its design, and its representation of Carrick’s evolution from an independent political entity to one of Pittsburgh’s many neighborhoods. If you would like to lend your support for the designation, please email the City's Historic Preservation Planner, Sarah Quinn at sarah.quinn@pittsburghpa.gov or come to the Historic Review Commission's public hearing and vote on Wednesday, December 5th at 1pm, 200 Ross Street. We would like to thank Amy and Michael Kuruc and their partnership to recognize and preserve this exceptional piece of our city. If you'd like to help our landmarking efforts, please consider donating to our Landmarking Fund. “Untitled Photograph,” Carnegie Mellon University Architecture Archives. This past week we submitted a City Historic Landmark nomination for one of the most extraordinary pieces of public art in Pittsburgh, the George Westinghouse memorial in Schenley Park. George Westinghouse, world-renowned Pittsburgh engineer and entrepreneur, passed away on March 12, 1914, sending the world into a state of morning. Prominent leaders, Westinghouse workers, and Pittsburgh officials attended his funeral en masse and shortly thereafter began the long process of honoring his legacy. The grounds of his Point Breeze home, “Solitude”, would ultimately become Westinghouse Park and across the city in Schenley Park, the Westinghouse Memorial started to take shape. On September 22, 1926 City Council granted the request to place the proposed George Westinghouse memorial in Schenley Park. Over the course of the next four years, the Westinghouse Memorial Association worked to raise funds, hire architects, sculptors, and landscape designers to bring the memorial into fruition. Henry Hornbostel, Eric Fisher Wood, David Chester French, and Paul Fjelde, all national treasures in their own fields, would ultimate be selected to collaborate on the memorial. Equally as remarkable was who funded the creation of the memorial. While the setting was provided by the City, over 55,000 Westinghouse Employees donated nearly $200,000 to make the memorial possible. 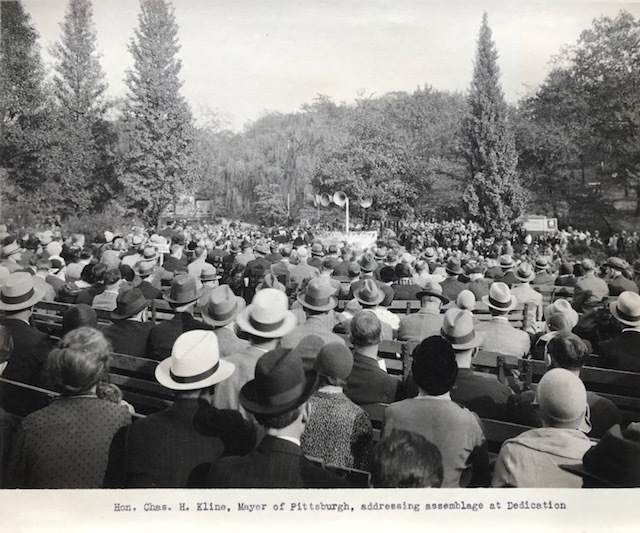 Its unveiling was a well attended (10,000 people) affair headlined by statesmen, captains of industry, and Westinghouse workers and emphasized the accomplishments of George Westinghouse. 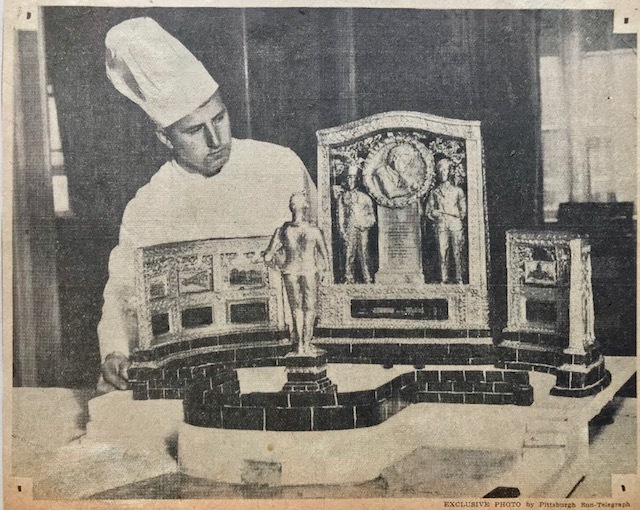 The banquet that followed at the William Penn Hotel downtown featured a scale replica of the memorial made entirely of sugar. Thanks to the efforts of the Westinghouse workers, the City of Pittsburgh, and the Pittsburgh Parks Conservancy the memorial remains largely as it did (although without its gold leaf covering) when it was first unveiled on October 6, 1930. We are thrilled to be able to put this nomination forward for consideration and hope that Council will move to add it to Pittsburgh’s Register of Historic Places. We would also like to note that this nomination would not be possible without Marilyn Evert, whose research contribution was as invaluable. This nomination is devoted to her memory. If you would like to lend your support for the designation, please email the City's Historic Preservation Planner, Sarah Quinn at sarah.quinn@pittsburghpa.gov or come to the Historic Review Commission's public hearing on Wednesday, November 7th at 1pm, 200 Ross Street. We would like to thank the City of Pittsburgh for its partnership to recognize and preserve this exceptional piece of our city. If you'd like to help our landmarking efforts, please consider donating to our Landmarking Fund. In partnership with the City of Pittsburgh, the Pittsburgh Parks Conservancy, and neighbors across the city, we're proud to lead the effort to list Frick, Highland, and Riverview Parks on the National Register of Historic Places by 2020.